Not everyone enjoys the festivities and excitement of Christmas. There are a lot of people who have no family to share the season with and no happy memories to carry them through. Nate is one of these people. As a baby, he was abandoned, adopted by a couple who really didn’t want him, and he grew up distanced from happy memories. Once he was old enough, he moved out and didn’t look back. He picked up a job on a Christmas tree farm and grew to love the family that ran it, especially their daughter, Molly. Invited into their home for Christmas, Nate learns that happy family memories of Christmas really do exist. But will it last? Or will a heartbreak interfere with his growing passion for this magical season. 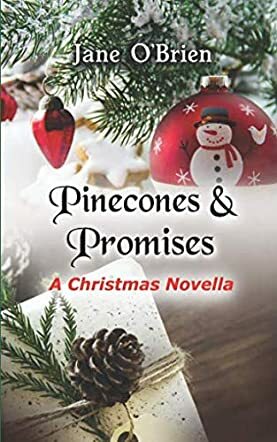 Jane O’Brien’s romance novella, Pinecones and Promises, nurtures the true meaning of Christmas. A gentle, compassionate story, the opening narrative provides the reader with Nate’s background in a realistic and sympathetic manner. The setting, primarily on a Christmas tree farm, is ideal for the initiation of a romance that is not only with the daughter of the family that owns the farm, but also with the beauty and excitement of Christmas and the love that makes it all possible. The characters are well developed and the reader is drawn into the story right from the opening lines. The reader feels compassion as Nate reveals his life story; they cheer when he finds love and learns to appreciate Christmas; and they cry when he feels heartbreak and rejection. Through it all, both Nate and Molly grow and learn to appreciate the wisdom of their elders and the words of scripture.